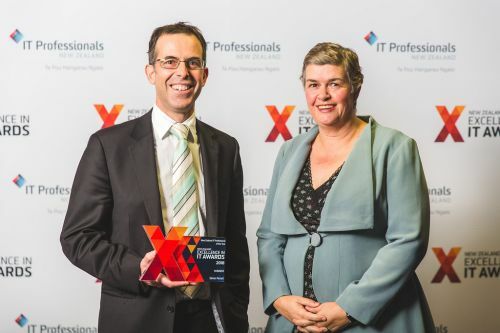 It was a huge celebration in Wellington on Thursday night, with the winners of the NZ Excellence in IT Awards announced at a huge gala dinner at TSB Arena. Not content with his day to day job as a senior manager at Datacom, Simon Ferrari is an evangelist for IT as a career, doing much of this work in his spare time. Sam has clear talents as a developer, but it is his participation in and support of the wider tech community that is particularly impressive. Seeing people so early in their careers already giving back and mentoring future generations of technology leaders is what sets Sam apart from his developer peers. Implementing a vast IT upgrade across the four Northern DHB's and providing continuity in healthcare to 1.8 million New Zealanders posed enormous challenges for Kevin's team. In this broad based project, 330 HealthAlliance staff worked in partnership with their DHB partners to integrate legacy data, multiple platforms and rapidly changing healthcare technologies with a clear vision and great practice. Seeing technology deployed to help solve New Zealand's shamefully high levels of domestic violence is an inspiring use of technology. This project saw Police gain access to unprecedented levels of information quickly and efficiently, helping those who keep us safe in our communities. As a pioneer of VR technology, Staples VR managing director Aliesha Staples clearly demonstrates leadership, innovation, and passion. While it's obvious she brings huge value to the health and VR industry through her work and projects, what makes her stand out is her proven desire to help the community and the difference she is making to children in hospitals around the world. As the interface between the tech sector and teachers in the classroom, this team of volunteer teachers has navigated through a period of huge change in the tech education landscape, built linkages with industry and engaged with the Education sector to support both the development and implementation of the Digital Technologies curriculum in New Zealand. The Takiwā team are helping to transform the lives of iwi, the health sector and educators through data visualisation. Information gathered from a wide range of public sources is presented so non data specialists can use it for planning, submissions to government and in "making the case" to stakeholders. Steve is not only a highly skilled and experienced technical communicator, but he has also shown a strong commitment to the technical communication industry over the past 20 years. As well as serving as a President of the Technical Communicators Association, he has contributed significantly as a mentor and supporter in New Zealand and Australia. Murray Wills was also recognised with the ITP President's Award for Contribution to the Profession, for his leadership and efforts in a range of areas from IT Governance (as the founding chair of the IT Governance Taskforce) through to significant educational contributions.